Is Jordan pass a visa? No, Jordan pass is not a visa, it only waives the visa fees if you stay minimum of 3 whole nights (4 days) in Jordan? Do people who hold Arabic nationalities need a Jordan Pass? No, People who hold Arabic nationalities pay the attractions fees like Jordanians, so Jordan Pass will not be useful to them (they must show a valid ID at each attraction). Can I visit the same attraction twice with my Jordan Pass? The Jordan Pass only allows single entry to each attraction. Repeat entry is not allowed unless for Petra if you buy the Jordan Explorer and Jordan Expert Packages. Where can I use The Jordan Pass? Which attractions are included? The Jordan Pass can be used in over 40 attractions, museums and castles. For a full list of the attractions click here. Are the attractions open all year round? Usually, the majority of attractions included in The Jordan Pass are open all year round, however, there may be some partial closures around official holidays. Check the opening hours and dates for each attraction in advance to help plan your trip. How long should we stay in Jordan in order to buy the Jordan pass? You can buy the pass regardless of the number of nights you stay in Jordan, but part of the pass's benefits is that it waives the visa fees (40 JDs) only if you are staying 3 consecutive nights and buy it before arrival to Jordan. How does Jordan pass work? Once you buy the pass, we email it to you as a pdf version and as an image, you should show it printed-out to the passport's officer since the QR code might be unreadable through your cell phone, this applies to the visa office and all touristic sites. Is ground transport included in the Jordan pass fees? No, the Jordan pass only includes the entry fees to some of the touristic places. What should I do if I didn’t receive any pass on my e-mail after processing the payments? You need to check your spam/junk folder. Is there any secure link to buy Jordan pass through? Yes, you can use the following link https://jordanpass.jo/buynow.aspx. Whom should I contact if I faced any problem with Jordan pass in Jordan? If you face any problem, you can contact the Tourism police on this number: 117777. What should I do if I get the message “not being able to proceed” when I try to purchase the pass? The payment gateway requires that 3rd party cookies are enabled in your browser, that might cause the problem. Please try from another PC or network. What should I do if the purchase keeps failing? Kindly try again from another browser such as Firefox or Opera, or using another PC, if the problem still exists, kindly contact your bank to check the case. Where can we find the downloadable digital brochures? Will I be asked to show my ID or passport at each Site? Yes, you will be asked to show your ID, otherwise you will be asked to pay for the site's entrance ticket. Can I upgrade the pass to Explorer or Expert package or downgrade the pass? No, you can not upgrade or downgrade the pass. Should the days of visiting Petra when holding an Explorer or Expert Passes be consecutive days? Yes, the days of visiting Petra should be consecutive days. Is Petra by night included in Jordan Pass? No, Petra by night is not included in any of the packages of Jordan Pass, you can use the pass to visit Petra for free only during the day between 6:00 am to 6:00 pm. Can I scan Jordan Pass ticket at any of Petra's gates? No, you can scan it only at Petra's Visitor's Center. Will my visa fees be waived off when entering Jordan from Wadi Araba Border and staying for two nights in Jordan and exiting Jordan from the same border, if I don't show Jordan Pass? Yes, If you are entering Jordan from Wadi Araba border and staying in Jordan minimum of 2 nights and then exiting Jordan from the same border, your visa fees will be waived off, without the need of showing a Jordan Pass at your arrival. * This rule only applies on Wadi Araba border. Why should I buy the Jordan Pass? The Jordan Pass provides you with hassle-free entry to over 40 of Jordan’s tourist attractions including Petra, Jerash, Wadi Rum, and much more. The Pass also includes the cost of your tourist entry visa. Is there any benefit in buying the pass now? If you purchase the Jordan Pass before your arrival to Jordan you can benefit from the entry visa fees exemption if you stay a minimum of three nights. How much can I save with The Jordan Pass? If you buy the pass before arrival to Jordan you will be saving more than 150 USD. Do Arabs benefit from the pass? Is the visit of Bethany Beyond the Jordan (Baptism Site) covered by Jordan Pass? No, but you can add it to the pass by paying extra 8 JDs instead of 12 JDs while purchasing the pass online. How can I activate my Jordan pass? You only need to scan it at the first touristic site in order to be activated. When will my Jordan Pass Expire? The Jordan Pass is valid for use within 12 months following date of purchase. But it will automatically expire after 2 weeks of the first time it is scanned in the first touristic attraction. This means you will no longer be granted entry into the touristic attractions included in the Pass. Does the Jordan pass waive the visa fees? 1- For people who hold a non-restricted nationality who are eligible to get their visa upon arrival to Jordan providing they will stay minimum of 3 whole nights (4 days) in Jordan. 2- For people who hold a restricted nationality who have Jordanian Embassy in their country providing they will stay minimum of 3 whole nights (4 days) in Jordan. You can not get your visa fees waived off if the visa was bought online. Does Jordan pass waive the visa fees if the visa was bought online? No, your visa fees will not be waived off if the visa was bought online. Does Jordan Pass waive the visa fees of a multiple entry visa to Jordan? No, Jordan pass waives the visa fees of only a single entry visa to Jordan. How long is the single entry visa valid for? The single entry visa is valid for 1 month, and can be extended easily from any police station by paying extra fees. Do I have to pay fees for visa extension if I hold a Jordan pass? You can pay 1.5 JDs at the Airport for each day you stayed in Jordan after the 1 month validity, or you can pay 40 JDs at the Police Station for visa extension of 3 months. How should I prove that I will stay 3 nights in Jordan? You will not need to prove anything, you will get free entry, and when you are leaving the country the immigration system at the airport will check if you stayed more than 3 nights, if not, you will be directed to an office to pay the fees. What are the nationalities which are allowed to get visa upon arrival to Jordan? Which borders provide visa upon arrival? 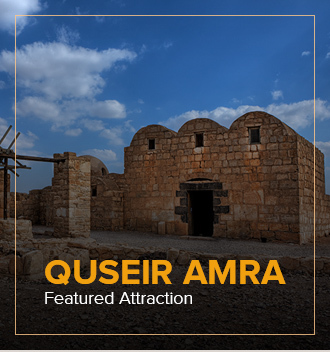 Queen Alia Airport and Sheikh Hussein Bridge (Jordan River Border) provide visa upon arrival, Wadi Araba border (Eilat-Aqaba border) provides visa upon arrival only for Jordan pass holders who are eligible to get a visa upon arrival provided they stay a minimum of 3 whole nights in Jordan. How will the visa fees be waived? You need to present the Jordan pass in the visa office at the airport in order to waive the visa fees. What are the fees for a single entry visa without the Jordan pass? The fees for a single entry visa without the Jordan Pass are 40 JDs (about 60 USD). What is the process for waiving the tourist visa with the purchase of Jordan pass for a resident in the gulf countries? Only Indians, and Non Arab Africans who have a valid residency in any of the gulf countries which does not expire before at least 6 months and a passport which will not expire before at least 6 months from arriving to Jordan are allowed to get a visa upon arrival in Jordan's Queen Alia International Airport, the fees for this visa are waived if they present the Jordan pass providing they will stay at least 3 consecutive nights (4 days) in Jordan. Can Jordan pass holders cross Wadi Araba border without a before-hand visa? Yes, Jordan pass holders of the non-restricted nationalities can have a visa upon arrival from Wadi Araba Border. Can the non-restricted nationalities have a visa upon arrival from Sheikh Hussein Border (Jordan River Border)? Can anyone have a visa upon arrival from King Hussein Bridge (Allenby bridge)? No, They do not issue a visa upon arrival at this border even for Jordan pass holders. Do I need a visa to enter Jordan arriving at Aqaba Airport? For restricted nationalities: you will need to have a before-hand visa from Jordan Embassy in your country. For non-restricted nationalities: you do not need to get a visa to enter Jordan if you are arriving at Aqaba Airport. What happens if I presented Jordan Pass but did not stay for 3 nights in Jordan and wanted to leave from Wadi Araba? You will have to pay 60 JDs. Can I enter from a border and exit from another one? Yes you can, except for restricted nationalities who entered from Wadi Araba, they need to exit from the same border. If I entered Jordan crossing a LAND border from westbank, and then went to westbank crossing Allenby bridge, and wanted to re enter Jordan again crossing Allenby bridge, will my visa still be valid? No, you will need a new visa to be able to re enter the country. Which nationalities are exempted from paying the visa fees? South Africa, Malaysia, Hong Kong, Japan and Vatican City. What are the Arabic nationalities that are not exempted from paying the visa fees? Somalia, Djibouti , Mauritania , Libya and Iraq.